DeltaGraph para Windows y Mac combina potentes herramientas estadísticas con extraordinarias capacidades de visualización de datos para mostrarlos de la forma que su audiencia espera. Con su inigualable selección de gráficas y su fácil personalización, DeltaGraph es la más completa aplicación de creación de gráficas para Windows y Mac. DeltaGraph® 5.6 for Windows combines powerful statistical tools with stunning data visualization capabilities to give your data audience appeal. With its unrivaled chart selection and easy chart customization capabilities you will find DeltaGraph® 5.6 the most comprehensive charting application available for Windows. DeltaGraph® 5.6 Windows is optimized to improve productivity and increase IT flexibility; while yielding high resolution charts that will give you a competitive advantage in presentations, posters, in print and on the web. DeltaGraph Windows and DeltaGraph Mac are cross platform compatible. Improve Productivity ? DeltaGraph®?s interoperability with programs like MS Office?, Adobe? Illustrator, Adobe? InDesign, Adobe? Photoshop and QuarkXPress? will save you time when preparing your charts for final production. Flexible file import and export options (43 total) insure that you can import your data from any application then export your chart in the file format that you need. IT Flexibility ? DeltaGraph® works well with most presentation, production and analysis software creating an optimization bridge that can tie several application together to create a simple and powerful work flow. Competitive Advantage ? 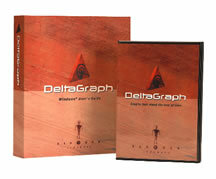 DeltaGraph®?s high resolution charts will make your audience take notice. PANTONE? color matching will give you the exact color every time. And complete customization features in DeltaGraph® give you the uniqueness you need to stand out from your competition. Data import file types: ASCII file with multiple delimiter support (.txt, .dat, .asc, .csv), SPSS Data file (.sav), Excel (.xls), Lotus 1-2-3, v1-v5, dBase II-IV/Clipper/FoxPro (.dbf), Paradox (.db), Quattro, Symphony. Graphic import file types: PICT, Encapsulated Postscript (EPS), Enhanced Metafile (EMF), Windows Metafile (WMF), SGI, JPG, PNG, MacPaint (PNTG), Quicktime (QTIF), Tiff (TIF), TGA, BMP. Data File Types: ASCII file with multiple delimiter support (.txt), SPSS Data file (.sav), Excel (.xls), Lotus 1-2-3, v1-v5, dBase II-IV/Clipper/FoxPro (.dbf), Paradox (.db), Quattro, Symphony. DeltaGraph®?s Chart Wizard provides step-by-step instructions for quickly creating charts. Exports charts seamlessly into Word and PowerPoint. Adobe? Illustrator, Adobe Photoshop, Adobe InDesign?, QuarkXPress? DeltaGraph® Chart customizations are maintained when exported as a non-embedded formats and easily imported into other graphic design applications. Import a variety of graphic file types for use in unique chart background and for use with DeltaGraph® Pictograph Charts.